It has been suggested that List of Shakti peeth in Bengal be merged into this article. (Discuss) Proposed since June 2018. The Shakti Peeth (Sanskrit: शक्ति पीठ, Śakti Pīṭha, seat of Shakti) are significant shrines and pilgrimage destinations in Shaktism, the goddess-focused Hindu tradition. There are 51 or 108 Shakti peethas by various accounts, of which between 4 and 18 are named as Maha (major) in medieval Hindu texts. Most of these historic places of goddess worship are in India, but there are seven in Bangladesh, three in Pakistan, two in Nepal, and one each in Tibet and Sri Lanka. Various legends explain how the Shakti Peetha came into existence. The most popular is based on the story of the death of the goddess Sati. Out of grief and sorrow, Shiva carried Sati's body, reminiscing about their moments as a couple, and roamed around the universe with it. Vishnu had cut her body into 52 body parts, using his Sudarshana Chakra, which fell on Earth to become sacred sites where all the people can pay homage to the Goddess. To complete this massively long task, Lord Shiva took the form of Bhairava. Lord Brahma performed a yajna (Vedic ritual of fire sacrifice) to please Shakti and Shiva. Goddess Shakti emerged, separating from Shiva and helped Brahma in the creation of the universe. Brahma decided to give Shakti back to Shiva. Therefore, his son Daksha performed several yagnas to obtain Shakti as his daughter in the form of Sati. It was then decided that Sati was brought into this world with the motive of getting married to Shiva. However, due to Lord Shiva's curse to Brahma that his fifth head was cut off due to his lie in front of Shiva, Daksha started hating Lord Shiva and decided not to let Lord Shiva and Sati get married. However, Sati got attracted to Shiva and finally one day Shiva and Sati got married. This marriage only increased Daksha's hatred towards Lord Shiva. Daksha performed a yagna with a desire to take revenge on Lord Shiva. Daksha invited all the deities to the yajna except Lord Shiva and Sati. The fact that she was not invited did not deter Sati from attending the yagna. She expressed her desire to attend the yagna to Shiva, who tried his best to dissuade her from going. Shiva eventually relented and Sati went to the yagna. Sati, being an uninvited guest, was not given any respect at the yagna. Furthermore, Daksha insulted Shiva. Sati was unable to bear her father's insults toward her husband, so she immolated herself. Enraged at the insult and the injury, Shiva in his Virabhadra avatar destroyed Daksha's yagna, cut off Daksha's head, and later replaced it with that of a male goat as he restored him to life.Virabhadra didn't stop fighting; he kept raging with anger. Gods prayed to lord Vishnu. He came there and started fighting him. Still immersed in grief, Shiva picked up the remains of Sati's body, and performed the Tandava, the celestial dance of destruction, across all creation. The other Gods requested Vishnu to intervene to stop this destruction, towards which Vishnu used the Sudarshana Chakra, which cut through Sati's corpse. The various parts of the body fell at several spots all through the Indian subcontinent and formed sites which are known as Shakti Peethas today. At all the Shakti Peethas, the Goddess Shakti is accompanied by her consort, Lord Bhairava (a manifestation of Lord Shiva). Shakti is an aspect of the Supreme Being Adi parashakti, the mother of the trimurti, the holy trinity in Hindu religion & scriptures. The history of Daksha yajna and Sati's self-immolation had immense significance in shaping the ancient Sanskrit literature and even influenced the culture of India. It led to the development of the concept of Shakti Peethas and thereby strengthened Shaktism. Enormous numbers of stories in the Puranas and other Hindu religious books took the Daksha yagna as the reason for their origin. It is an important incident in Shaivism, resulting in the emergence of Parvati in the place of Sati Devi and making Shiva a grihastashrami (house holder), leading to the origin of Ganesha and Kartikeya. Shakti Peethas are shrines or divine places of the Mother Goddess. These are places that are believed to have been blessed with the presence of Shakti due to the falling of body parts of the corpse of Sati Devi, when Lord Shiva carried it and wandered throughout Aryavartha in sorrow. There are 51 Shakti Peeth linking to the 51 alphabets in Sanskrit. Each temple has shrines for Shakti and Kalabhairava, and most Shakti and Kalabhairava in different Shakti Peeth have different names. Some of the great religious texts like the Shiva Purana, the Devi Bhagavata, the Kalika Purana,the AstaShakti and Pithanirnaya Tantra recognize four major Shakti Peethas (centers), like Bimala (Pada Khanda) (inside the Jagannath Temple of Puri, Odisha), Tara Tarini (Sthana Khanda, Purnagiri, Breasts) (Near Berhampur, Odisha), Kamakhya Temple (Yoni Khanda) (Near Guwahati, Assam) and Dakshina Kalika (Mukha Khanda) (Kolkata, West Bengal) originated from the parts of the corpse of Mata Sati in the Satya Yuga. Vasishta Rajitapara" (Rushikulya is a holy river flowing on the foothill of the Tara Tarini Hill Shrine). "Body Part or Ornament" refers to the body part or piece of jewelry that fell to earth, at the location on which the respective temple is built. Apart from these 4 there are 48 other famous Peethas recognized by religious texts. According to the Pithanirnaya Tantra the 51 peethas are scattered all over present day countries of India, Sri Lanka, Bangladesh, Nepal, Tibet, Bhutan and Pakistan. The Shivacharita besides listing 51 maha-peethas, speaks about 26 more upa-peethas. The Bengali almanac, Vishuddha Siddhanta Panjika too describes the 51 peethas including the present modified addresses. A few of the several accepted listings are given below. One of the few in South India, Srisailam in Andhra Pradesh became the site for a 2nd-century temple. First relating to Brahmanda Purana, one of the major eighteen Puranas, it mentions 64 Shakthi Peetha of Goddess Parvati in the Bharat or Greater India including present day India, Bhutan, Bangladesh, Nepal, Sri Lanka, some parts of Southern Tibet and parts of southern Pakistan. Another text which gives a listing of these shrines, is the Shakthi Peetha Stotram, written by Adi Shankara, the 9th-century Hindu philosopher. According to the manuscript Mahapithapurana (c. 1690 – 1720 CE), there are 52 such places. Among them, 23 are located in the Bengal region, 14 of these are located in what is now West Bengal, India, 1 in Baster (Chhattisgarh), while 7 are in what is now Bangladesh. Rishi Markandeya composed the 'Devi Saptashati' or the seven hundred hymns extolling the virtues of the Divine Goddess at the shaktipeetha in Nashik. The idol is also leaning a little to the left to listen to the sages composition. The Saptashati or the "Durga Stuti" forms an integral part in the vedic form of Shakti worship. The third eye of Mata Sati fell below a tree in a mortuary in the Ishan corner of Vakreshwar. This is on the bank of the north flowing Dwarka river in the east of Baidyanath. Here Mata Sati is called Chandi Bhagwai Ugra Tara and Bhairav is called Chandrachur. This Shaktipeeth is called Tarapith in Birbhum district West bengal, India. The modern cities or towns that correspond to these 64 locations can be a matter of dispute, but there are a few that are totally unambiguous, these are mentioned in the Ashta Dasa Shakthi Peetha Stotram by Adi Shankara. This list contains 18 such locations which are often referred to as Maha Shakthi Peeths. [*]Sharada Peeth: This temple is currently non-existent*. Only ruins are found in these places. Its ruins are near the Line of Control (LOC) between the Indian and Pakistani-controlled portions of the former princely state of Kashmir and Jammu. 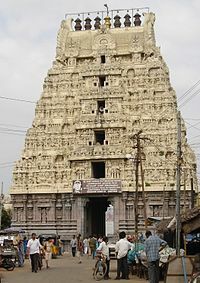 Instead, Sringeri Sharada Peetham, Sringeri in Karnataka even though not a Shakthi Peetha, is this aspect of the goddess. 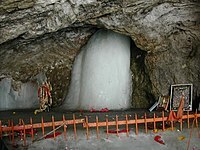 Requests have been made by the Hindu community in Pakistan to the Pakistani government to renovate the temple, the issue being raised by former Indian Home minister L. K. Advani to the Pakistan authorities as a confidence-building measure, by increasing the people to people cross-border interaction. Among these, the Shakthi Peethas at Kamakhya, Gaya and Ujjain are regarded as the most sacred as they symbolise the three most important aspects of the Mother Goddess viz. Creation (Kamarupa Devi), Nourishment (Sarvamangala Devi/Mangalagauri) and Annihilation (Mahakali Devi). When chanted every evening, all the enemies would get destroyed all the diseases would vanish, and prosperity would be showered. Dineschandra Sircar (1998). The Śākta Pīṭhas. Motilal Banarsidass Publ. ISBN 978-81-208-0879-9. ^ Fuller, Christopher John (2004). The Camphor Flame: Popular Hinduism and Society in India. Princeton: Princeton University Press. p. 44. ISBN 978-0-691-12048-5. ^ a b Vanamali (2008). Shakti: Realm of the Divine Mother. Inner Traditions. pp. 83–84, 143–144. ISBN 978-1-59477-785-1. ^ a b Kunal Chakrabarti; Shubhra Chakrabarti (2013). Historical Dictionary of the Bengalis. Scarecrow. p. 430. ISBN 978-0-8108-8024-5. ^ "Introduction and Preface". www.sacred-texts.com. ^ "Kottiyoor Devaswam Temple Administration Portal". kottiyoordevaswom.com/. Kottiyoor Devaswam. Retrieved 20 July 2013. ^ RAGHUBIR LAL ANAND (February 2014). IS God DEAD?????. Partridge Publishing. p. 15. ISBN 978-1-4828-1823-9. ^ Author, Unknown. Tantra Chudamani. pp. Lines 13–14. ^ Pollock, Sheldon (2006). Language of the Gods in the World of Men. University of California Press. ^ a b "Pandits denied entry into temple in Pakistan Administered Kashmir". The Hindu. 3 October 2007. ^ "Pak should renovate Sharada Temple in Pakistan Administered Kashmir: Advani". zeenews.india. 2 May 2007. Retrieved 30 July 2013. Phyllis K. Herman, California State University, Northridge (USA), "Siting the Power of the Goddess: Sita Rasoi Shrines in Modern India", International Ramayana Conference Held at Northern Illinois University, DeKalb, IL USA, 21–23 September 2001.